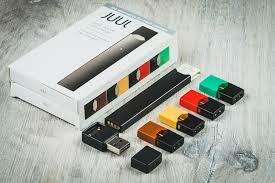 While suspensions and expulsions in Connecticut schools are on the decline, the incidence of such disciplinary action in connection with vaping is increasing dramatically, according to a report released Wednesday by the state Department of Education. 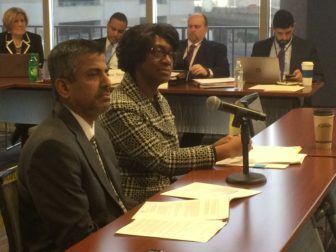 “The one stand-out piece from this year’s report is the six-fold increase” in vaping sanctions, the state Department of Education’s chief performance officer, Ajit Gopalakrishnan, told the State Board of Education at a meeting Wednesday. The State Department of Education’s Ajit Gopalakrishnan and Charlene Russell-Tucker present the state’s report on suspensions and expulsion Wednesday. The number of cases stemming from school policy violations decreased by 32.8 percent and those connected to theft went down 29.7 percent. The total number of school-based arrests, however, went up last year compared to the previous year: from 1,244 in 2016-17 to 1,797 last year. Four years earlier, in 2014-15, the number was 1,737 and it had dropped for two years in a row before last year’s upturn. One piece of positive news from the report, however, is the decline in suspensions of young children since 2014-15, with in-school suspensions for students in pre-kindergarten through second grade down 39 percent and out-of-school suspensions for this age group down more than 75 percent. Gopalakrishnan noted that in 2015 the state passed a law prohibiting suspensions of students in pre-kindergarten through grade two unless the incident is violent, endangers others, or is of a sexual nature.